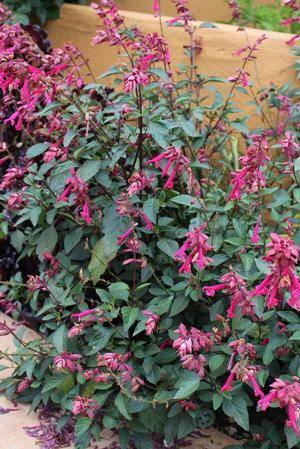 Wendy's Wish sage grows to around 2½-3½' tall and wide. 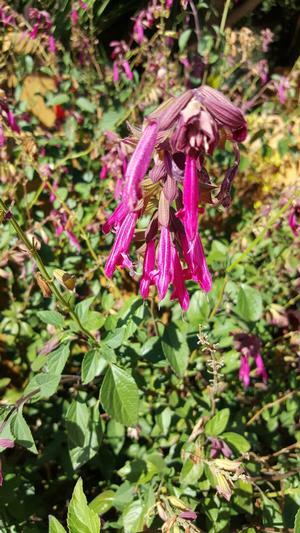 It's evergreen in warmer climates and produces masses of magenta tubular flowers on maroon stems. The foliage is dark green. Wendy's Wish sage was released in the US at the beginning of summer 2009 after being featured at the spring PlantHaven Pack Trials in Carpinteria, CA. It received U.S. Plant Patent number 21,889 on April 26, 2011. We love the flower color and the long blooming season of Wendy's Wish. 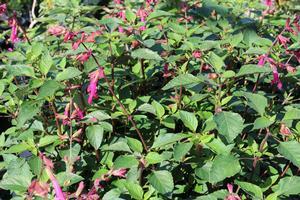 Bees and hummingbirds love the flowers too! However, in order to look good, it seems to need more water here in Soquel CA than we want to give it. Therefore, we've decided to stop growing it. If you live in an area where there's no water shortage, then you might want to consider Wendy's Wish.